One of the 6 spots labeled “SOLPT Parking” in the parking lot adjacent to our office complex. Metered parking on Piedmont avenue. Free street parking in the neighborhood. Pleasant Valley (North Side): 2 Hour Limit until 12 Noon. 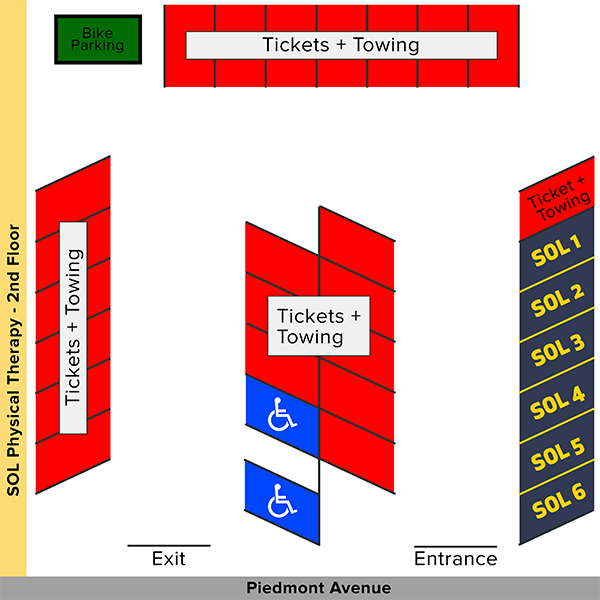 If you decide to park in a spot not specifically labeled for SOL, our neighbors will mark your car for ticketing or towing. This illustration of our parking lot shows you exactly which spots are SOL’s. Our office is directly to the right of Hollies’ Nails. Our parking lot is directly to the left of Berkshire Hathaway. Our office and parking lot are across the street from the complex with the Verizon Wireless. Take BART to the MacArthur station. As you exit the station, take 40th St. east for 10 blocks until you reach Piedmont Ave. Take a left and travel 5-6 blocks until you reach Glen Eden Ave. Our building is on the left next to Berkshire Hathaway. Take 80 west to 580 east. Use the Broadway Auto Row/Webster St. exit, keep left, and merge onto Broadway. Turn left onto Piedmont Ave. and drive for 1 mile. Our building is on the left between Hollies’ Nails and Berkshire Hathaway. Take 880 north to 980. After about a mile, exit 980 onto 580 east. Use the Broadway Auto Row/Webster St. exit, keep left, and merge onto Broadway. Turn left onto Piedmont Ave. and drive for 1 mile. Our building is on the left between Hollies’ Nails and Berkshire Hathaway. Take the Broadway Terrace exit and keep right, turning onto Broadway Terrace, heading west. Drive 1.5 miles until you reach Broadway, turn left onto Broadway heading south. Drive two blocks and make a left onto 51st/Pleasant Valley Ave. In a half mile (4 blocks), turn left onto Piedmont Ave. and our building is on the right between Hollies’ Nails and Berkshire Hathaway. Drive west on Hwy 24 for 5 miles, crossing Hwy 13. Exit Broadway, crossing underneath Hwy 24. Drive for 1 mile until reaching Broadway. Make a left onto 51st/Pleasant Valley Ave. In a half mile (4 blocks), turn left onto Piedmont Ave. and our building is on the right between Hollies’ Nails and Berkshire Hathaway.